Have you ever been swimming in the ocean on a chilly day and then stumble across a hidden patch of warmth? There's nothing like it. It instantly soothes and makes you feel welcome where before you felt uncomfortable and somewhat paranoid. After months of scouring the virtual mermaid shelves and coming away slightly irritated, Merminia has become that delightful surprise-a patch of pleasant, familiar warmth. What fascinates me is the fact that this book, in so many ways, is the polar opposite of my own. Historical, mythical, under-sea kingdom dwellers who radiate light and battle opposing kingdoms-but there's so much more to it then that and the scene it's set upon stretches from end of the ocean to the other and is not afraid to push the reader's imaginations to the limits. Things which startled me at first, such as fire and flowers underwater, healing rays and hair that stays pretty braided even when submerged simply become part of the norm and reminded me that not everything I read needs to have a factual basis. It's imagination food and as creative as anything in the Harry Potter series-relax, read on and grow big and strong! The heroine Selinne, is of course beautiful and headstrong (If this kind of thing bothers you then go read something gritty. Mermaids are supposed to be perfect and a bit sneaky) but can play saviour or damsel depending on the conditions. I especially like one of the beginning scenes when there is a battle and she pockets some jewellery left behind. This made me laugh-because this is exactly what a mermaid would do, especially a young one. And she instantly pays a price for this which is a great way of sneaking in a YA relevant theme without preaching. The hero, or who I assume to be the hero, Gabriel, is written so well that he reminds me of the better behaved though suspicious teenage boys I grew up with. I close my eyes and I can almost see the conflict on his face and it's a wonderful that a female writer has captured this practiced indifference. Too often lately male heroes are just throwing themselves at the girl's feet, regardless of the repercussions and so I appreciate Miss Cole's ability to twist a stereotype and make it believable. There is a third character and I worry that I've fallen in love with the guy who is destined to lose out on the girl. Aramis is wonderful. And though he's selflessly devoted to Selinne, there is nothing saccharine about it. His feelings do not weaken his character or detract from his attractiveness. He's not the crazy stalker-guy, or the 'pity-me' best friend but a fierce protector with unwavering devotion who sees her so clearly that he never feels the need to push his own feelings to the forefront of her mind because he is resigned to the fact that she's not in love with him. I see this curving towards a love triangle but I will try not to invest too much hope that it swings-and stays-in Aramis's direction. But I can dream. Merminia is written in 3rd person from alternating perspectives but thankfully, the author keeps this style clean and easy to follow. It is written for YA, so sexuality is not flaunted and violence is kept within boundaries, and even though I've been shying away from this genre of late Miss Cole has written this story in a way that is accessible to all readers-from Middle grade to adult I cannot think of one moment in this story that could lock and bolt it into one classification. I have to take a moment to emphasise that this is the kind of YA/paranormal romance which stays true to the genre and doesn't skew it to please teens everywhere by trying to be cool. There are no cell phones, no insta-love, no bitchy school friends, no black and white 'jealous popular girl' (There is one but her character development is as unique as the others and is in no way a stereotype) no trips to the mall, no naive 'Oh he likes me? Really?!' moments and no brand-dropping. Not one other mermaid or paranormal romance I've read lately can boast this-they've all, in sections or sometimes constantly-read like a string of facebook posts among cheerleaders. But Merminia is about mermaids. Not about how cool it would be, to be a mermaid, so you could take a selfie with a tail. If I had ten thumbs, I'd stick them all up for this feat alone! YA's desperately need more books that focus on character development on the deeper level, and do not just sprout catchphrases and wax lyrically about beauty and boys. On that note I'lll add that I couldn't tell that this was an Indie book. It has been meticulously edited and crafted. The narrative voice is strong and smooth, but the most outstanding part of Emm Cole's writing is her ability to knock you on your tail with some prolific sentiments, usually within character dialogue, that are truly touching. For the first time ever-I actually highlighted stuff. 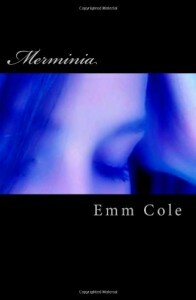 Merminia is the mermaid book that every other mermaid book aspires to be. This is the real deal-fans of The Little Mermaid, Mer cosplay enthusiasts and romantic fantasy readers are going to love this! There is beauty without glitter, death without suffering, drama without becoming maudlin, sadness without angst and darkness without shadow. In an ocean full of Indie authors, Emm Cole has emerged as a bona-fide writer, and I eagerly look forward to reading all of her future works.